AVID's specially priced 4 x DVD Box Set brings together our 4 great salsa dance instruction DVD'S taking you from the beginners and intermediate sessions in London to Mambo, Merengue and Cha Cha Cha and Pilates based fitness techniques for better salsa dancing in the Dominican Republic. Section One: Dedicated to footwork and designed to allow the body to get used to the basic steps. Section Two: Learn how to move the upper body and hips. 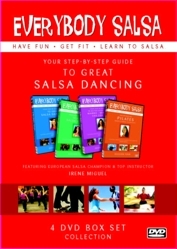 Basic steps are repeated and then incorporated into a complete salsa routine. Section Three: Dance with a partner combining all the moves you have learnt so far. Section One: Reviews Basic Salsa Steps, then concentrates on footwork and basic step variations including backwards and forwards movement. Section Two: Focusing on upper body movement incorporated into basic steps, also including shoulder work and half and full body turns. Join Irene Miguel and her dancers as they take all they have learnt in session one and two to the breathtaking island of the Dominican Republic. Bring A Little Caribbean sunshine into your home as you learn how to Mambo, Merengue & Cha Cha Cha. Watch the steps, enjoy the music & LET'S SALSA!! !